Director Steven Spielberg’s adaptation of author Roald Dahl’s 1982 children’s book about a big, friendly giant—and the young orphan girl he befriends—comes to the big screen with humor, heart and a big, friendly message about the magical, mystical power of dreams. Set in 1980s London, the movie wastes no time in establishing its tone or introducing its characters. We meet Sophie (newcomer Ruby Barnhill) just moments before she spies a giant in in the darkness outside her upstairs window. Seconds later, his massive hand reaches into her bedroom, sweeps her up and takes her away to Giant Country, far away from the city—and beyond the edges of any map. Sophie, understandably, is concerned that she’s about to be eaten—but that’s not the case at all. This giant isn’t like the other giants. They eat people, but he doesn’t, subsisting wholly on a diet of foul-smelling vegetables called snozzcumbers. The other, much bigger, much nastier giants bully the BFG. 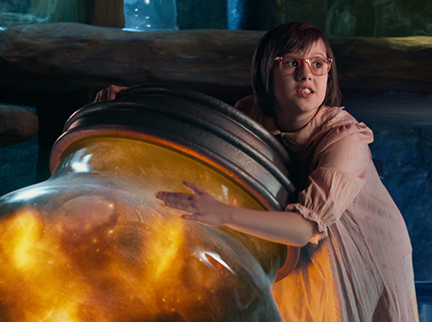 At first, she tries to run away from the “big, friendly giant,” whom she calls BFG. But gradually, Sophie is charmed, especially as the kindly, introspective BFG hides and protects her from the much bigger, nastier giants—a gang of behemoth beasts with names like Bloodbottler, Butcherboy, Gizzardgumper and Meatdripper, who storm into his home, bully him and toss him about like a plaything. Spielberg, of course, is one of Hollywood’s leading storytellers, and Dahl (who died in 1990) was the marvelous British novelist who also wrote Charlie and the Chocolate Factory, James and the Giant Peach, Matilda and Fantastic Mr. Fox. 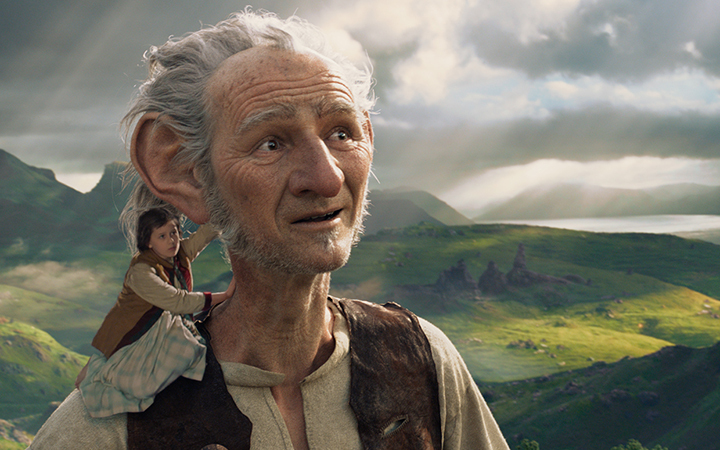 In The BFG, Spielberg’s signature touches—spunky kid; misunderstood outsider; adults who slowly come around to understanding—fit perfectly into Dahl’s narrative, which combines lightness and whimsy with whirls of darkness and spikes of danger. In one of the movie’s best sequences, Sophie and BFG end up in Buckingham Palace, where they dine with the Queen of England (Penelope Wilton, who played Isobel Crawley on Downton Abbey) and her staff (which includes Rebecca Hall and Rafe Spall). There BFG toasts everyone with a concoction he calls frobscottle, a fizzy homemade drink with some immediate, hilariously explosive gastro-after-effects—BFG gleefully dubs them “whizpoppers”—that even send her majesty’s Corgis into uncontrollable comedic spinouts. “He’s magnificent, your giant,” one of the queen’s men confides to Sophie. 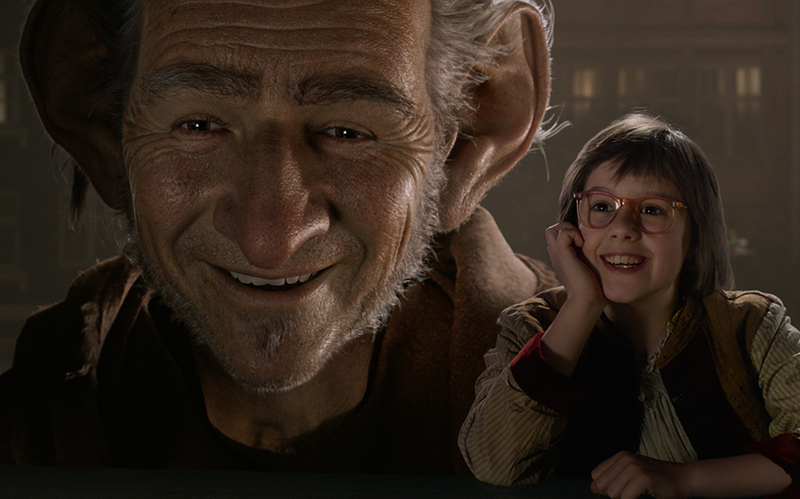 As they treat the BFG like a BMOC and a VIP, you’ll have to agree: Yes he is!